There is a lot of literature and articles available about goal setting and the importance thereof. Very little has been written about the biggest barrier to achieving our goals (or even being bold enough to set them in the first place) and achieving our potential, namely fear. Fear of failure or that we are not enough. Unless we are one of those born with unnerving confidence (often manifesting it self in bluster, belligerence and arrogance) we have that monkey mind nagging away at us telling us your not enough. We also tend to compare and contrast our inner feelings with others outward show exacerbating this feeling. This inner critic can get in our own way of trying something that is new and or takes us out of our comfort zone. We tend also tend to compare and contrast our inner feelings with others outward show! This blog will draw on the works of the ancient stoics to get our fears out of our own heads and examine them as if there were a defendant on trial. Step 1: Answer the question …What if I ……………….. Step 2: Question: What could possibly go wrong! Define them all. Step 3: For each of those reversals identify what we could do that is in our control or influence to proactively prevent the reversal happening in the first place. Step 4: For each of those reversals defined, if they did happen what could we do to repair it post event. Step 6: Write down the cost of doing nothing (inaction) from an emotional, financial and physical perspective, over a 6 month, 1 year and 3 year view point. The ancient stoics use a term called the premeditation of evils malorum praemeditatione from which this approach has been taken and amended. Getting our fears out of our heads and objectively analysing them affords us the chance to press on and give us the best opportunity of fulfilling our potential. ‘Feel the fear but do it anyway’ as Susan Jeffers puts it of her book of the same name. This whole subject is nicely summed up in Letters from a Stoic by Seneca , even though it was written some 2000 years ago, it seems that those of us living in the 21C could use a dose of this ancient wisdom. 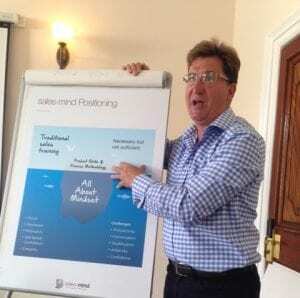 For more information about our sales training courses please contact us.